Pollinating insects like bees, butterflies and flies have had a rough time of late. A broad library of evidence suggests there has been a widespread decline in their abundance and diversity since the 1950s. This matters because such insects are critical both for the reproduction of wild plants and for agricultural food production. » While much of our conservation effort – and media attention – is focused on the honeybee, other pollinators such as butterflies, wild bees and small flies, need protection too. » There are more than 800 wild (non-honey) bee species in Europe alone, a significant proportion of which are endangered or vulnerable. » Encouraging farmers and other land managers to work cooperatively will help create bigger, more impactful areas to support pollinators. 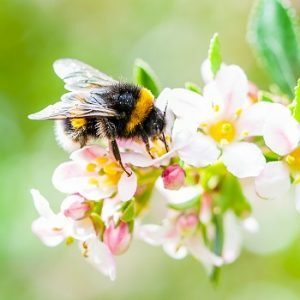 Is your garden bee friendly?